Summit Racing now carries Airhawk Motorcycle Seat Cushions. 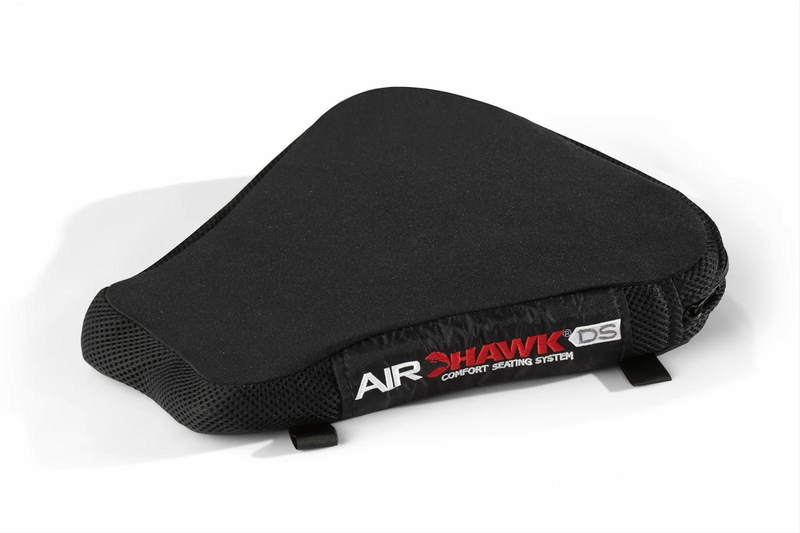 Airhawk seat cushions use scientifically proven air technology to distribute the rider’s weight over the entire cushion pad; the interconnected air cells help alleviate numbness and pain pressure points. Summit Racing now carries Airhawk Motorcycle Seat Cushions. Airhawk seat cushions use scientifically proven air technology to distribute the rider’s weight over the entire cushion pad; the interconnected air cells help alleviate numbness and pain pressure points. Airhawk guarantees its cushions will double a rider’s time in the saddle. The Airhawk air pad also acts as a shock absorber, mitigating bumps and vibrations to reduce rider fatigue. The overall design permits plenty of airflow through the seat as well, which keeps the rider cool and dry. Installation is easy; just secure the Airhawk Seat Cushion using the included web straps. This means the cushion can be removed quickly for short jaunts, then reinstalled for the long hauls. The cushion inflates with simple lung pressure, and the inflation valve locks close to prevent accidental deflation. The cushion should be inflated/deflated to the rider’s comfort preference. A detailed video on the installation process can be found at Airhawk’s website. Airhawk Seat Cushions are available in several styles to fit most common motorcycle seat types, including cruisers, dual-sports, and sportbikes. Airhawk also makes a pillion pad so passengers can stay comfy, too. The seat cushions are made in the USA.